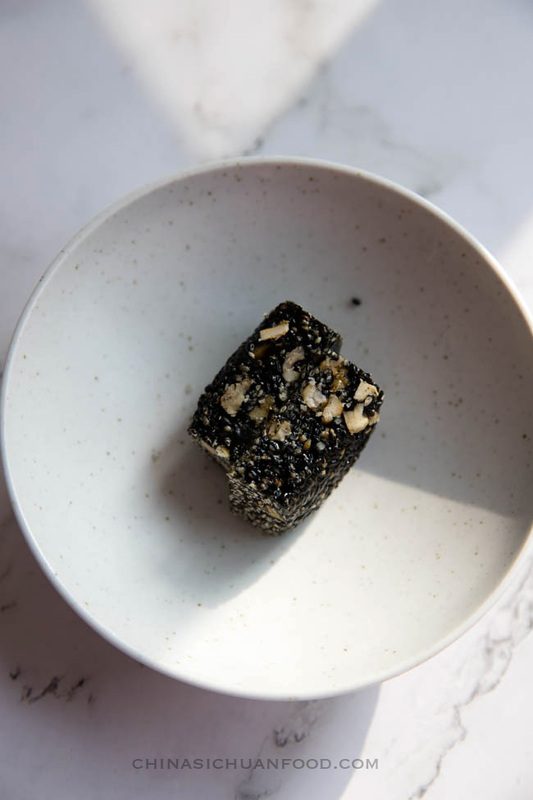 Sesame candy 芝麻糖, the sister snack of our peanut candy have been popular in China for quite a long history.Those candies were always available in the store around the corner. Well packaged and be ready to be picked as gift. 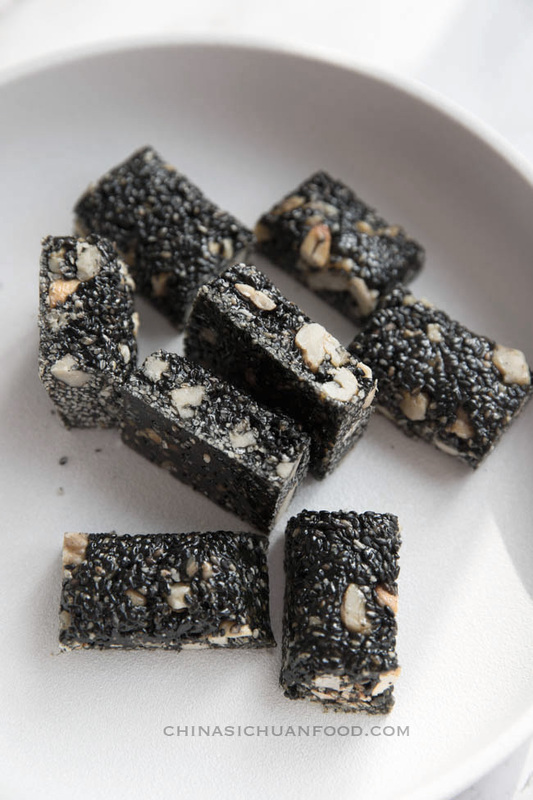 Well cooked sesame candy has a mild sweetness, not overwhelming sweet. We love it’s strong aroma and crispy texture. New Year is coming and I hope to present this as a gift and snack food for family party. You can serve it with a tea party. Note about the syrup: do not stir it frequently before the white sugar dissolves. The temperature of the syrup is the key to successful peanut candy. If the syrup is under-cooked, the candy cannot turn crispy after cooled and cannot form lovely shapes. 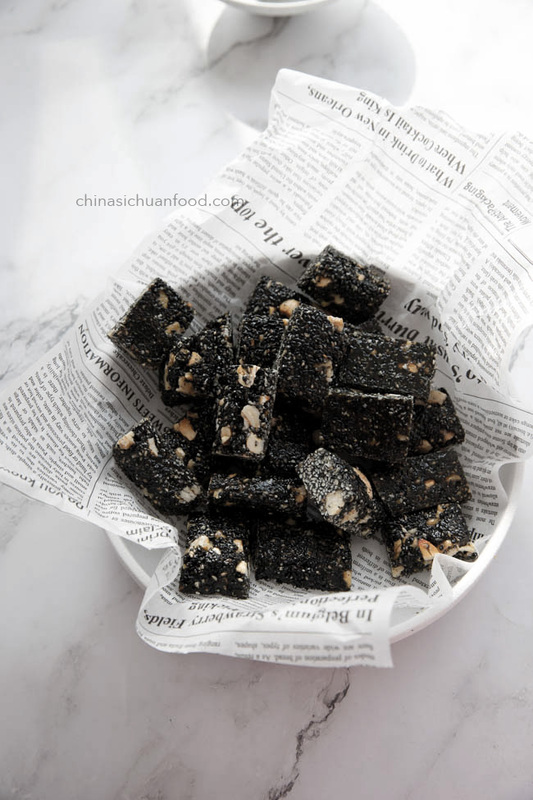 When the syrup is around 110 temperature C, it produces very soft and chewy texture like what we want in another traditional snack Sachima (沙琪玛). If the syrup is over cooked, it produces a strange bitter taste to the candy. I suggest heat the syrup around 125 to 130 degree C with the help of the syrup drop testing described in the instructions. 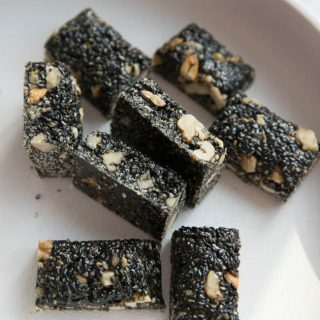 Maltose (麦芽糖) is the commonly used ingredient for lots of traditional Chinese sweet desserts. It can help to form better shapes but has a lower sweetness. Maltose should be found in Chinese stores. It might be replaced by regular regular if hard to find. You need to cut the candy when it is still hot for beautiful cuts. Slightly wait for a while and do not get yourself burnt. You can adjust the type and amount of nuts based on personal preference. 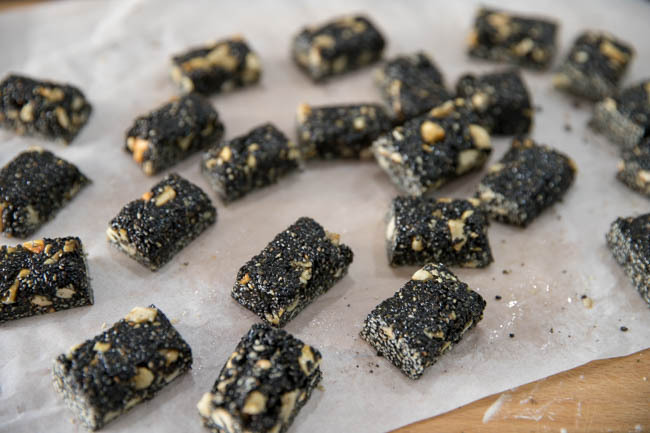 Adding baking soda can make the candy even more crisper by mixing it previously with nuts. But we do not include it in traditional Chinese version. I do not use it this time too. 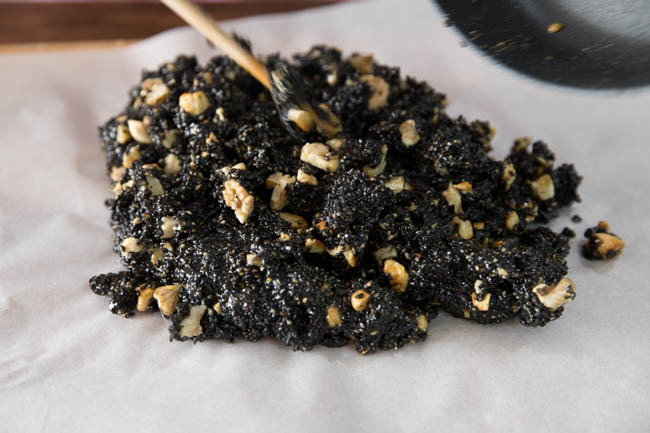 It is extremely important to slow down your fire after the sugar mixture is well formed, otherwise, the sugar obtains a extremely high temperature which may burn the nuts. Roughly chop walnut and cashew and slightly roast over slow fire until aromatic and crunchy. Then mix the nuts with toasted sesame seeds. 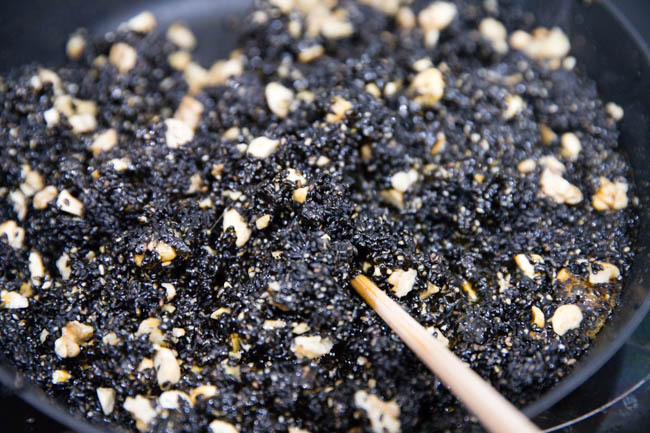 If you only get raw sesame seeds, check how to toast sesame seeds at home. You can mix the baking soda with the nuts if using. In a large think bottom pot, add maltose (麦芽糖), sugar and water. Simmer until well dissolved, continue heating and gently stir until a uniform smooth texture is formed. Test the syrup (syrup drop testing)| use a chopstick to and get a small drop of syrup. Soak it in cold water quickly and taste the drop after cooled down. If the syrup is well cooked, the drop should be cooled very quickly and taste quite hard and crisp. Otherwise it might be quite soft and sticky. Or if you get a thermometer, heat the syrup around 125 to 130 degree C. Do not touch the bottom of your pan when placing the thermometer. Slow down the fire firstly and stir in all the nuts. Combine quickly until all of them are well combined. Be quick in this step. 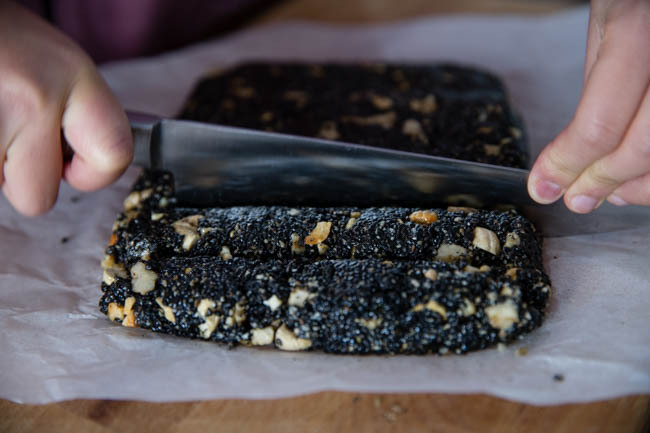 Transfer the mixture to a board with a kitchen paper, flatten the surface with a rolling pin. Wait until slightly cooled but still hot. Cut into small pieces and package in air-tight containers. 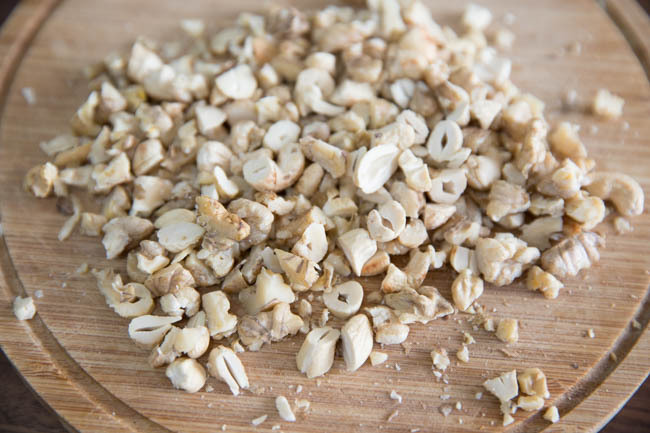 Roughly chop walnut and cashew and slightly roast over slow fire until aromatic and crunchy. Then mix the nuts with toasted sesame seeds. 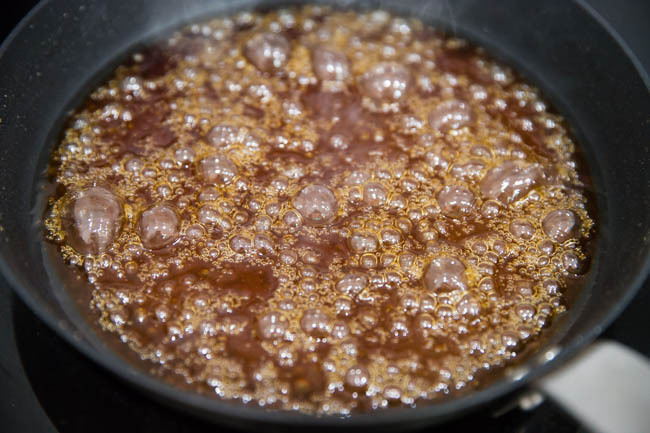 In a non-stick pan, add sugar, salt, oil and maltose. Heat over medium fire until the syrup obtains a lovely amber color and there are large bubbles formed. Test the syrup, use a chopstick to and get a small drop of syrup. Soak it in cold water quickly and taste the drop after cooled down. If the syrup is well cooked, the drop should be cooled very quickly and taste quite hard and crisp. If under cooked, it should be quite soft and sticky. Or if you get a thermometer, heat the syrup around 125 to 130 degree C. Do not touch the bottom of your pan when placing the thermometer. Slow down the fire and mix the nuts quickly until well mixed. Transfer to a baking paper and shape it into a rectangle. 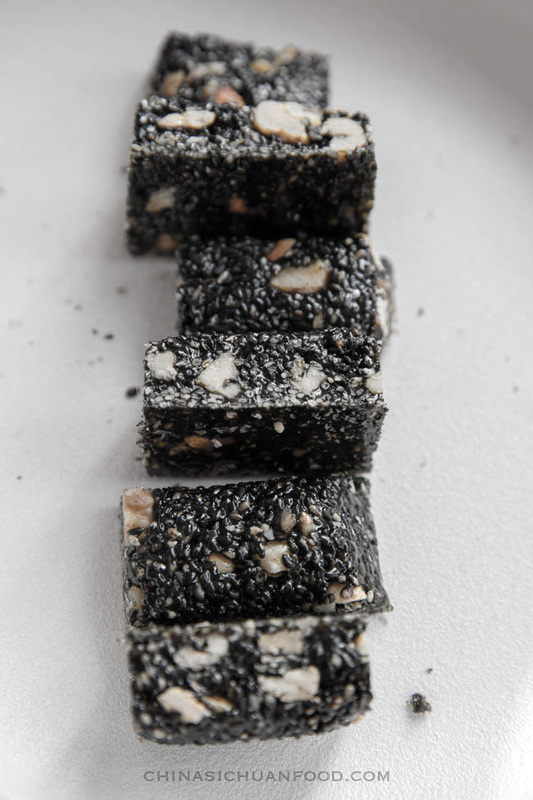 Cut into small pieces about 3 cm long and 2 cm wide when it is still hot. Keep in air-tight container up for 2 weeks.